Cat Rambo is a Nebula-nominated writer, successful online writing teacher, current president of SFWA, and one of my Clarion West classmates–along with Ann Leckie, who I’m interviewing next week. I’m a great admirer of her short stories (I’ll be publishing some fan art of a few of them in a bit), like this one and this one. Her first novel came out this year, too, in the lovely and well-developed world of Tabat (I have a draft of the sequel in my inbox, and I can’t wait!) Also, she’s tons of fun to hang out with, and everyone should do so, but hopefully not all at once. 1. Although you write stories in other venues, you have at least two persistent worlds. One is Tabat where your novel takes place. Can you talk about the world and how it came to be? Tabat started with a game concept. A friend was working on a MUD (a text-based multi-player game) where each administrator would create their own city, and I decided to do a seaport. One of the cool things about the game engine was that you could add tags onto room, so there were bits of description that only appeared under certain conditions, including things like time of day, season, moon phase, tide, and so forth, including things like if the player was carrying a specific object or had particular spells on them. I went nuts with it. I built a city where you smelled fish when the tide was high and the wind was coming from the south, and where the tiles of the great Moonway shifted in color depending on whether the moon was full or lean. In the spring there was the smell of particular flowers when you descended the stairways leading from one terrace to another, and in the fall, storms sweeping in from the south-east brought the smell of rotting reeds from the marshes bordering the city on one side. Alas, much of my work was lost in a server accident, and after that discouragement and the falling away of the other administrators, Tabat never got to see actual players. So when I started writing fantasy stories, it was a logical place to set some. I knew it well, and it’s gotten even further fleshed out in my head over the decade I’ve been working with fiction in it. Writing a fantasy quartet in it has been fun, but the next volume, Exiles of Tabat, actually moves the reader outside the city, accompanying Bella and Teo. 2. Likewise, you have a space station (Twicefar, right?) where you’ve set a lot of stories. (I can link to some here.) How did that develop? Twicefar grew out of a single story that I wrote while at Clarion West, Amid the Words of War, which is set in a brothel named The Little Teacup of the Soul aboard the station. As characters emerged in one story, I ended up exploring them further in others. One of my favorites is “Kallakak’s Cousins,” which appeared in Asimov’s. The universe around that far-future setting has hosted some stories as well, such as TimeSnip, Angry Rose’s Lament (another Clarion West story), and Bots d’Amor. 3. What new writing skills have you learned from teaching regularly? I’ve gotten better things like placing the reader inside the character’s head, rather than a spot about six inches behind it or, worse yet, hovering at a distance. A lot of it are little tricks, devices I wouldn’t have thought about if I hadn’t been thinking about the topic for a particular class. And I’ve gotten much better at knowing how to get from “this would be nifty” to finished story. I keep getting people who tell me they want to learn how to tell the ideas that will turn into stories from the ones that will peter out. And that’s not actually a skill you pick up. Instead you learn how to reliably turn something into a story. 4. You and I have both attended a lot of workshops in different venues. In my experience, different workshop cultures have different strengths and weaknesses. Common, useful metaphors known in sci fi workshops might not be common in graduate programs that concentrate on realism. What did you learn in graduate school that doesn’t get included in most science fiction workshops? Hmmm. I think one of the things that gets emphasized in grad workshops as opposed to SF workshops is a sense that you’re part of the overall conversation of literature, that anything you write is influenced by and in some ways a reply to the texts that have moved you in one way or another. I wrote “Bus Ride to Mars” as a love poem to Geoffrey Chaucer, who I adore, for example. Do you need to have read The Canterbury Tales to appreciate it? I sure hope not. But there’s great pleasure in reading a text and seeing the layers of influence at work in it, and sometimes SF workshops don’t talk about that or even denigrate it as snooty literary stuff. That’s a shame and it’s something that hampers us. I’m very happy to see efforts to keep genre history — particularly the pieces that end up dropping away often — preserved in projects like Kris Rusch’s Women in SF website. 5. How does your women’s studies background influence your writing at this point? Does that relationship continue to develop as you keep writing? Always. I’ve got an undergrad certificate in Gender Studies from Notre Dame, plus I taught in the Women’s Studies department at Towson for a number of years. It shapes a lot of my reading as well as many of my approaches to life and acts as a goad to keep me trying to understand and learn about my own filters and blind spots. Sometimes it overtly influences a story, as with “All the Pretty Little Mermaids,” another Asimov’s story, which actually also has a little tribute to one of my favorite professors from Notre Dame, Charlene Avallone, in it. 6. Is there a color that you would never dye your hair? I probably would never bleach it again. 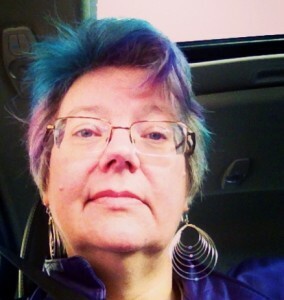 I did that one year to go purple at World Fantasy and found the process alarmingly painful. 7. As president of SFWA, can you describe your plan for fixing all problems with the Hugo Awards? Hahahahaha. I’m too busy with the SFWA mission of doing stuff that actually helps working writers. Lots of cool things lately, and more to come this year. For recent examples, see the Speakers Bureau and the SFWA Star Project program. 8. Upcoming projects and other news: take it away. I just finished Hearts of Tabat, the sequel to Beasts of Tabat; it’s off with beta readers right now. Finishing up the second edition of Creating an Online Presence for Writerswith lots of interesting updates. Releasing two collections this year, one of steampunk stories on June 1 and another two-sided collection from Hydra House in August. Writing lots of stories, finishing up “The Wizards of West Seattle” for Patreon supporters later this month. Working on more on-demand classes, including both class and book version of Moving from Idea to Draft. Plenty of travel this year, including the Nebulas next week, Gencon, Worldcon, Westercon, Dragoncon, Orycon, and the Chinese Nebulas in Beijing in the fall. Whew! This entry was posted in Interviews by Rachel Swirsky. Bookmark the permalink.